It's Christmas and I am spending it alone. I spent all week just dreading this moment. It isn’t that I haven’t been alone before, there was a Christmas or two ago when my son and grandson didn’t arrive until late on Christmas Day. And my daughter rarely gets home for Christmas, so I’ve been alone, but never have I been alone for all of the Christmas holiday. I thought I’d write something uplifting, a ‘how to’ article telling of things that one could do to keep loneliness at bay. I was determined that I would n ot cry, not mourn, not sink so low that I couldn’t find my way up again. So I got up this morning with those thoughts on my mind, and then I went to work. I work half days in a little consignment/resale shop. I do all the decorating, the staging, and everything else that must be done in retail. It’s a big change from teaching, but I love it just as much. We were to close at 3 today, and I was dreading coming home to an empty house on Christmas Eve. Before I left work my friend who owns the shop loaded my arms with gifts. 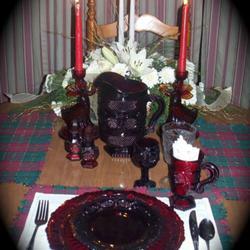 My mom used to collect red glass. She had tons of it, dishes, glassware, salt and pepper shakers, coffee cups, cake servers, she had it all. But she never had a red pitcher. I inherited Mom’s red dishes, but I rarely used them. Somewhere along the way I developed a love for pitchers, unique ones, old ones, colorful ones, but just like my Mom, I never had a red pitcher. I opened the biggest of my friend's gifts to me, and there it was, the red pitcher that matched my Mom’s old red Avon Cape Cod dishes . Ahhhhh, my heart did a flip. 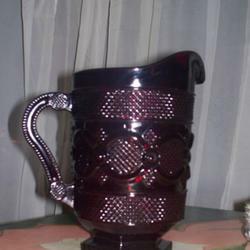 I had not used those red dishes in many years, but here was the matching red pitcher. It was only three in the afternoon and I had a few gifts to deliver to my neighbors. I did that, visited for awhile, but in the back of my mind, I could think only of that red pitcher. When I pulled back into my driveway after delivering the gifts, I noticed a bit of moisture falling from the sky. The weatherman had predicted snow for this Christmas weekend, but we haven’t had snow on Christmas Eve for a very long time, so I paid no attention to the weatherman. I was much more interested in my new red pitcher. First, I decided to change into my red plaid flannel pajamas. There would be no company for me on this night and Christmas isn’t Christmas without my red plaid flannel pajamas. The cats were clamoring for attention, so I took care of first things first. 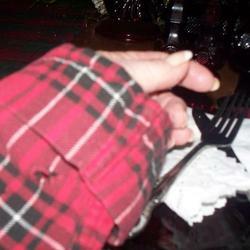 I fed the cats, I turned the tree lights on and then I donned the red plaid flannel pajamas. As I walked through the den, I flipped on some Christmas music and waltzed into the dining room where my red pitcher waited. You’ll notice I have a thing about red. There was a knock on my back door. Now if I have a knock on my back door, I know it’s either family or a close neighbor. Knowing my family was miles and miles away, I opened the door, not worried a bit about my red plaid flannel attire. And it was. It was Christmas Eve and it was snowing. Only minutes before there was nothing but a drop or two of moisture, but now it was snowing! 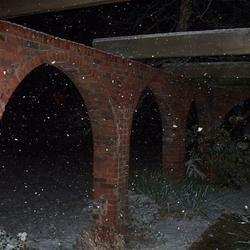 The ground was covered, so was my deck, and snow was falling, fast and furious. 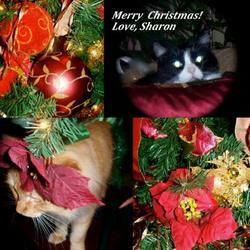 We visited for awhile, I in my red plaid flannel pajamas and she in her warm winter clothes. When she left I looked again at the red pitcher. I watched the snowfall. Thoughts of my Mom and early Christmases came to mind. I remembered those days when we had company and Mom served homemade fruitcake on red plates. She made hot apple cider and served it from red mugs. And on Christmas morning she made pancakes with warm syrup and big slabs of homemade butter and served them on the red plates. I drank my morning milk from a red mug. In those days in the mountains, it always snowed on Christmas. 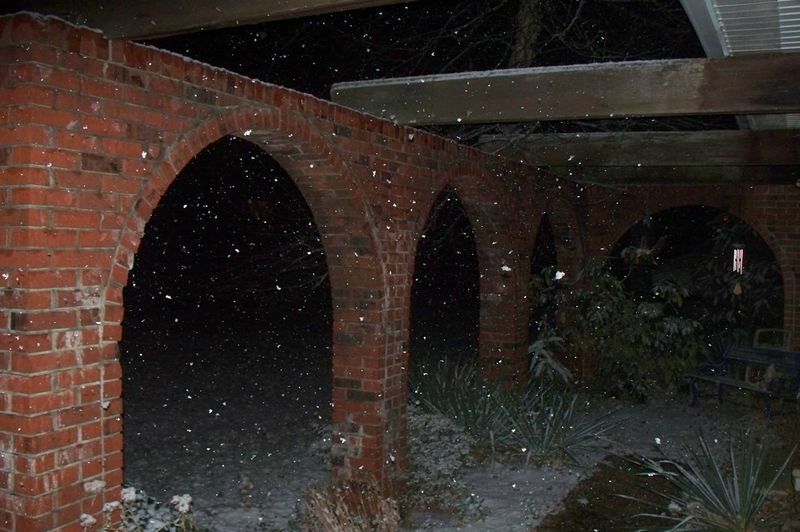 It was snowi ng! I ran to the garage and dragged in the ladder. Those red plates and mugs were high in a corner cabinet and I needed them in my hands. The ladder served its purpose and went back into the garage. Next I needed the white napkins that my Granny Ninna made. They had lived in the hutch for years, but not tonight. 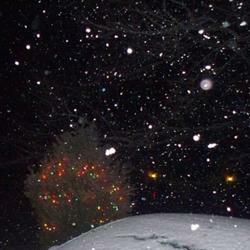 It was Christmas Eve and it was snowing! I needed those napkins! 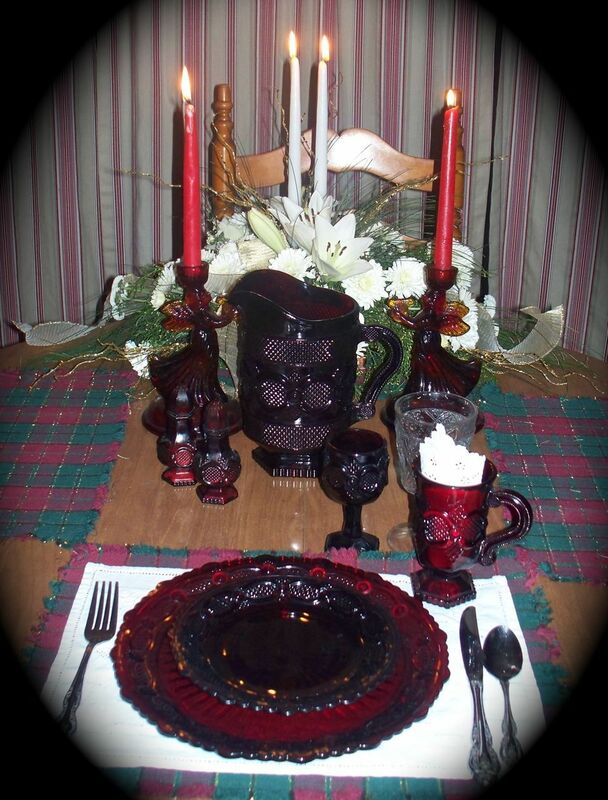 I have candlesticks that match the red dishes, out they came along with two red candles and two white napkins. My dinner was already planned, pasta with broccoli and a white garlic sauce. I grabbed pots and pans, veggies and pasta. It was getting dark and it was Christmas Eve and it was snowing. I nearly danced through my dinner prep, White Christmas played through the room as I quickly cooked dinner for one. I arranged napkins, one for a placemat, one beside my red plate. Ninna’s old pressed glass goblet that she got in a package of detergent sometime in the 50’s held my water. 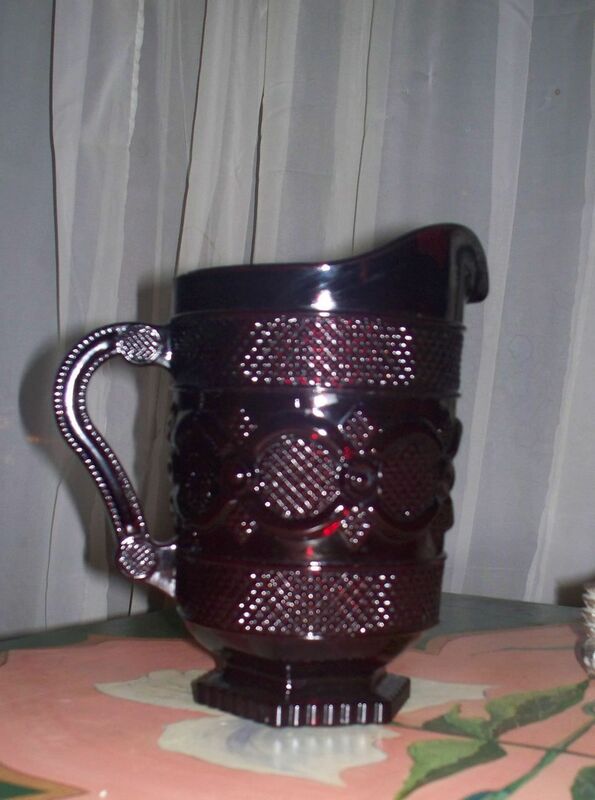 One of Mom’s red mugs held my hot tea, and her old silver adorned each side of the red plate. I lit the red candles, and two white ones from an arrangement a friend had given me. The lights were low, the music flowed through the room, it was Christmas Eve and it was snowing! 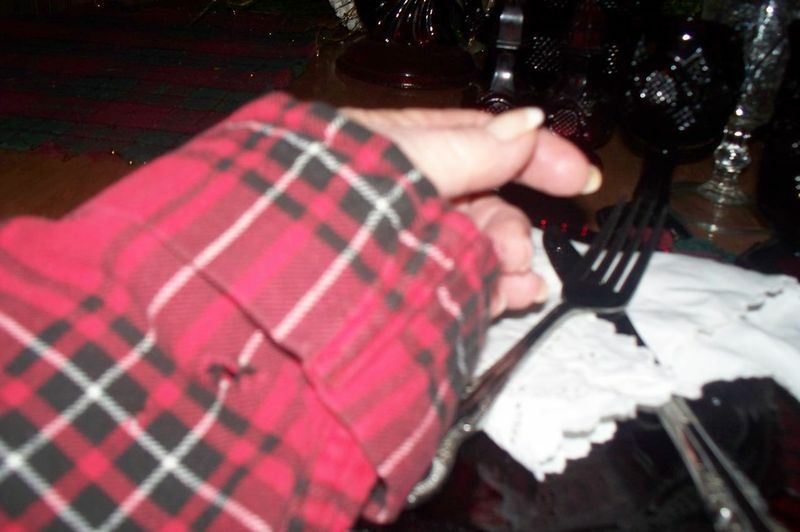 There is nothing more fun than having a semi formal dinner in red plaid flannel pajamas! Dinner is over now. 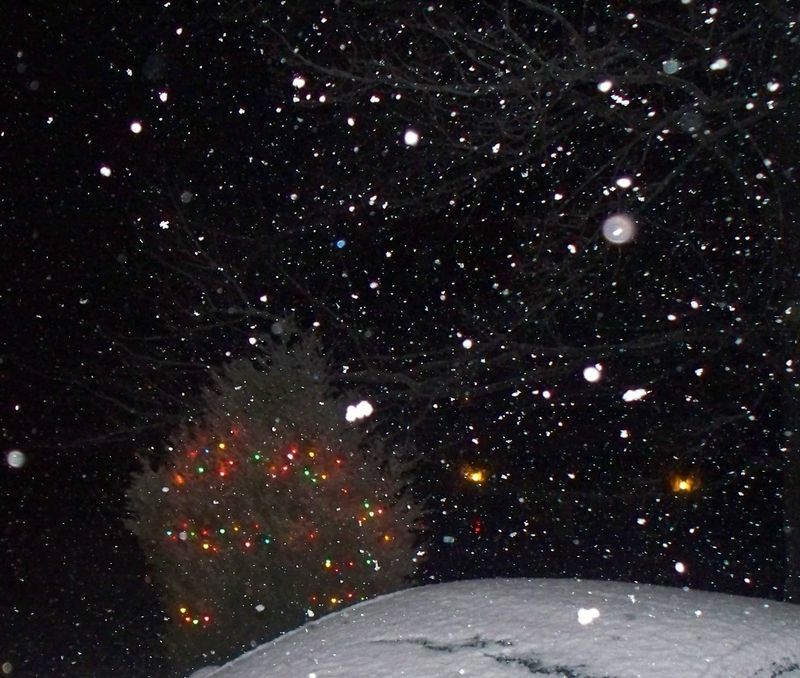 It’s very late, nearly Christmas Day and it’s still snowing. I’ve made it this far into the night with nothing but smiles and memories. My heart is filled with Christmases past, with family who is no longer with me, with the love I still feel from them. It’s Christmas and it’s snowing and I am warm and snug in my red plaid flannel pajamas. There will be no sadness in this house this Christmas. There is no room for loneliness in my heart. Two unexpected gifts, one from a friend and one from Nature, have changed everything. I thought I’d be lonely. I thought I’d be searching for activities that I could do to get through this holiday season. I was so wrong. Happiness comes when it is least expected and it comes from within. Oh, I know the gift of the red pitcher triggered it. And I know the falling snow helped. But it’s the little things that make up who we are that carry us over the rough spots. My daughter called tonight, my son will call on Christmas Day. And I will talk with my grandson then, too. I talked with my friend: "Polly, it's snowing!" And she laughed because her New York is already covered in snow. We are all connected, though we are miles apart. My parents, my ancestors, my loved ones, those who have been gone for years, we are all still connected. It’s the memories of them, the memories of past Christmases, that bind us and pull us out of dark corners. I wish for you good memories and beautiful snowfalls, red pitchers and red plaid flannel pajamas. I wish for you unexpected moments that open your hearts to the joy that can only come from within. I wish for you a very Merry Christmas.